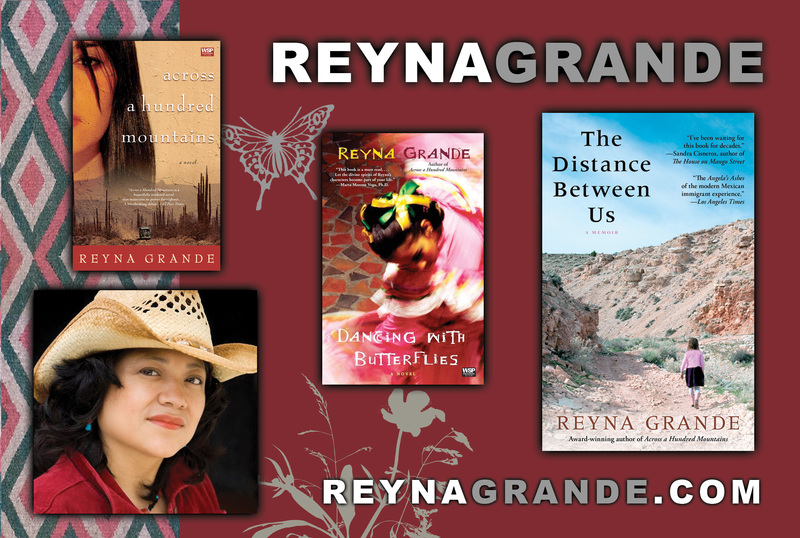 Reyna Grande, author of The Distance Between Us, Dancing with Butterflies, and Across a Hundred Mountains. One Book, One Community of Monroe will take a trip south next year, when the community of Monroe, MI will read The Distance Between Us together. Program highlights include a visit from author Reyna Grande, one of the premier Latina voices in the nation. But how to remind community members about next spring’s programs, still eight months away? Books in Common supplied the answer. Hundreds of eye-catching postcards, decorated with Reyna’s picture and photos of her three published books, are available for staff at the local community college, students, and community members to share. Whether they’re mailed, pinned to bulletin boards, used to jot down notes, and bookmarking textbooks or a copy of The Distance Between Us, the postcards help spread interest and knowledge about one of the community’s signature events. This entry was posted in Issue #3, Newsletters, Reyna Grande, The Distance Between Us and tagged Across a Hundred maountains, Dancing with Butterflies, One Book One Community, Reyna Grande, The Distance Between Us. Bookmark the permalink. Both comments and trackbacks are currently closed.